Press the Lessons tab located on the Voweletics website menu bar. Voweletics consists of 26 lessons. 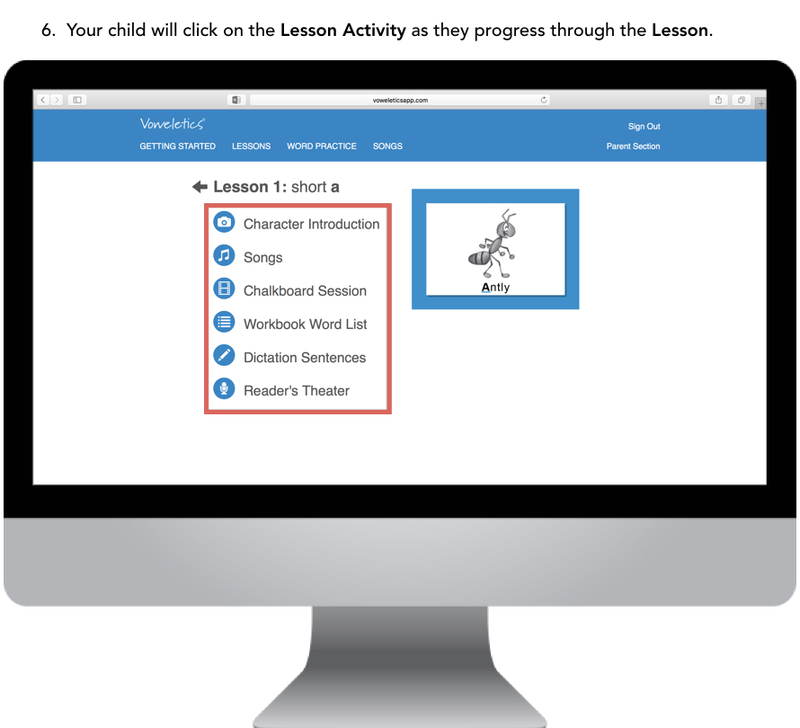 Children simply scroll down through the lessons and click on chosen lesson numbers or skills. Similar order in skill instruction and learning activities for all lessons was built into the Voweletics teaching model. By doing similar activities for each new vowel skill, children become more independent learners as they develop their self-confidence. Children eagerly anticipate the next lesson and embrace the associated learning activities. On the right side of the menu bar, you will find the Parent Section. 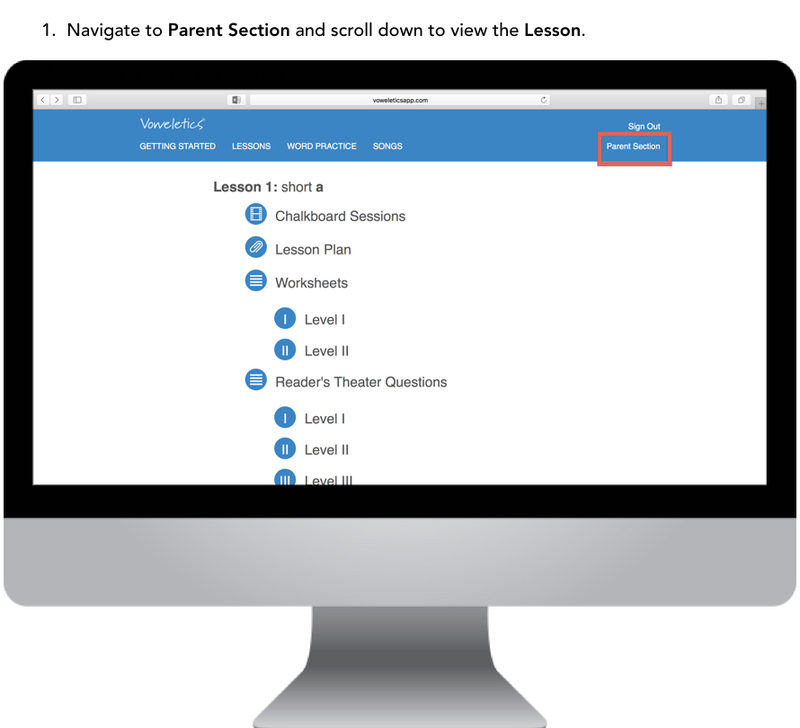 This is where you will find Lesson Plans, Worksheets, Reader's Theater Questions and Spelling. The Parent Section is also arranged according to lessons. You will be scrolling down through the lessons as you work through the program, picking and choosing extra materials you would like to use. 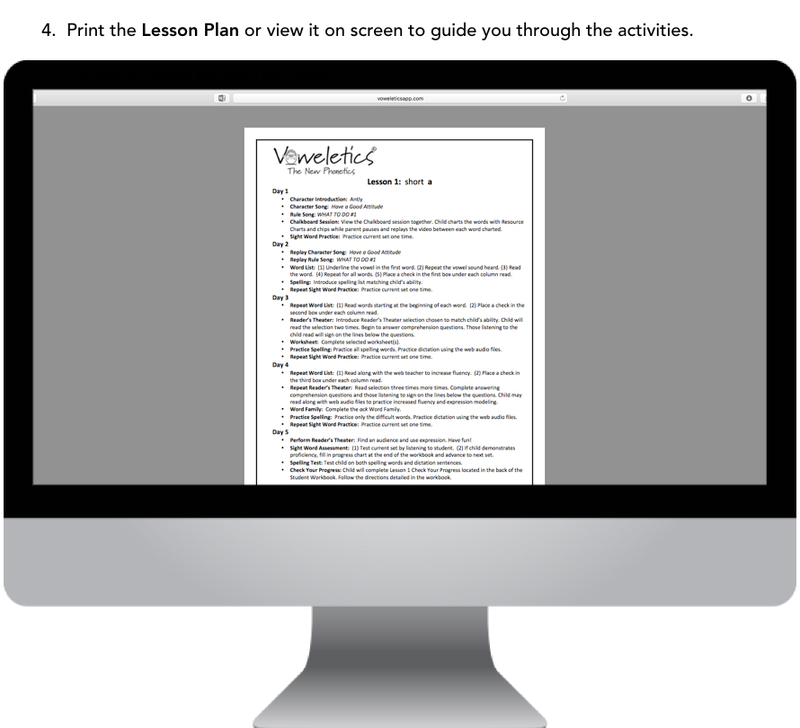 A one-page lesson plan accompanies each of the 26 Voweletics lessons. They are organized in a Day 1 –5 format. Parents are encouraged to progress through the lessons in the order outlined. There may be some “picking and choosing” of activities to complete depending upon your child’s ability. Lessons MUST be followed sequentially. The skills build upon one another. Some lessons may be easier than others for your child, so you may move more rapidly on those. Do NOT go out of sequence. It is suggested you go through the program in its entirety. Homeschool parents are encouraged to then repeat the program in its entirety the following school year. When lessons are repeated, parents will choose the higher skill level activities where provided. You will choose as a parent how to vary the activities. Learning to read is not easy! Repetition is often needed to provide automatic recall when sounding out words. You should go through the Lesson Plan prior to starting the lesson. Organize the materials needed for your child. You will need to match their skill level for Worksheets, Spelling and Reader’s Theater Questions. It is suggested you print any materials needed for instruction prior to beginning the lesson.